I'm searched on here (and Google) and can't find that many reviews of the Butterfly Amicus Pro. I'm not sure why this is the case as it seems to be a very good robot, with a lot of features, for a reasonable price (compared to some of the competition). 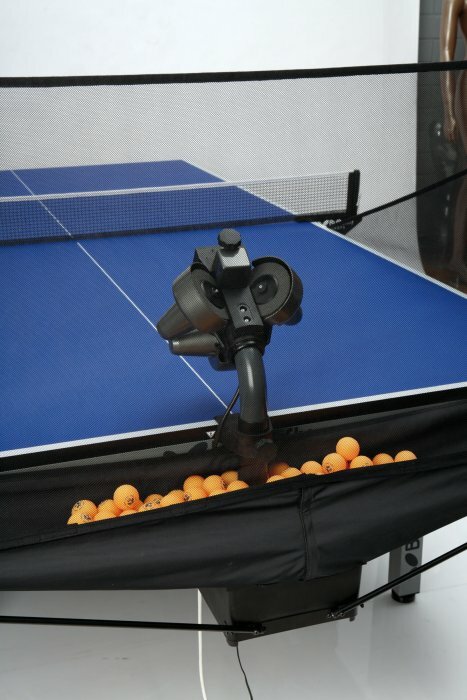 Also, I hear that a new version is due out this year which incorporates more features (such as the ability to programme up to six balls, with different spin, speed and placement). For example, you can have one ball drop short with backspin, one long with topspin, one wide with side and topspin, etc, all in one program. Like I say, the price of this robot is very competitive, so I'm just wondering why there are not many reviews of it. Does anyone on here own this robot or have at least tried it out? Last edited by ChrisBuer on 12 Apr 2014, 15:25, edited 1 time in total. 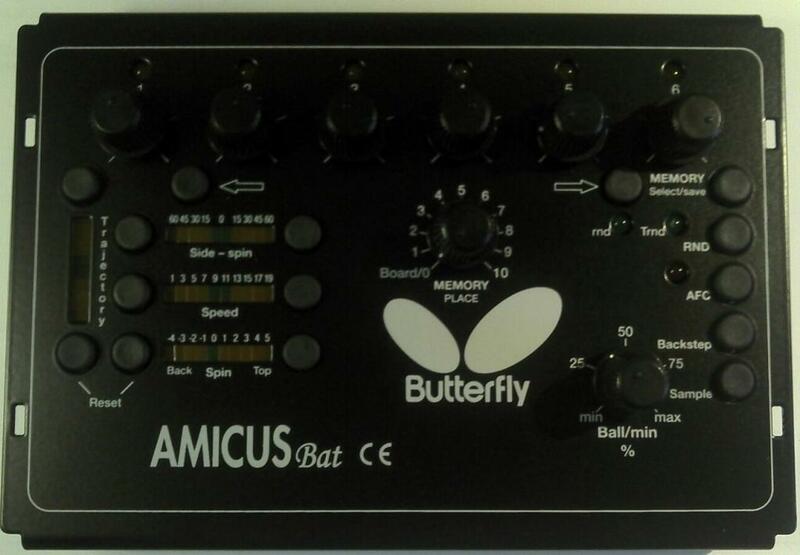 I have a Butterfly Amicus which was upgraded to "Pro" spec (by the addition of control panel mounting for player's side of table + adjustable delivery head) for me by Butterfly. The build quality is excellent. The facilities are numerous. My experience has been that I only scratch the surface i.e. don't use it for elaborate drills. This is probably because I have access to good multiball sessions locally. Snags ? - none with regard to functions. At first I was not happy with the occasional erratic in ball delivery - the odd random ball thrown in for no reason - this is why I returned to Butterfly. They gave it first class attention and returned it in its upgraded condition (to Pro spec). I also have a very old TTMatic. A much more basic machine but probably one that would now fill my needs (as I just use robot for grooving strokes so only call upon it to give me 2-ball sequence at max) but I do use the TTMatic net instead of the Butterfly one. This may be just habit since I have developed the hang of quickly putting that net up but perhaps it means the TTMatic is a better net than the Butterfly. I went for the Butterfly which, having researched, I considered to be the best available. Initially frustrated as detailed above but since put right by Butterfly it has been great. So, conclusion is that Yes, I would recommend one. The old Amicus 3000 was always too expensive (almost $3000 here), which is why most people never looked at them. This new one looks more affordable though, and with 3 heads it looks very interesting! Yes, this was my point. It's cheaper, has more functionality and is more portable. With 3 heads, it can produce more spin variation within a single programme than any other robot I know about, plus with the proposed new model coming out in the next few months, the configurable options will be even better. I was fortunate. When I purchased my original Amicus I got it for $1400 from Voroco Sports and the deal included balls and some other goodies like rubber and a couple of different small-mini Butterfly Blades. Does that include the Y&T 989H? That robot sounds like it does everything the Amicus does but with a touchscreen LCD instead of complicated-looking dials. When I was looking for a new robot about five months ago it seemed like the top-of-the-line Double Snake was the most sophisticated unit. In my first post on this thread, I copied in a photo of the prototype display panel that was being mooted as the new unit that will be released later this year. It does pretty much everything you'd want from a robot in terms of functionality. I've been looking into different robots and the amicus pro seems to be a great robot to purchase. Has anyone played with the amicus pro before? If so, could you post your experience below with pros and cons? Also, does anyone know the release date of the new control panel as shown on the original post? I haven't played with it but I'm told the new unit should be released sometime in Q3 (September /October). Ah right ok, does anyone know the pricing of the new model/control panel, and will it just be sold as the control panel alone or with the robot? I will probably wait for it if it isn't too expensive. Does anyone know where this will be available to purchase from? Do they have their own website? What is a robots average life span if looked after well and used daily? Do they last a couple years or longer? No news yet on the pricing but it's been suggested that it'll replace the current model which retails for around £999.99 here in the UK. I've seen it cheaper in Europe for around EUR 799.00. I believe the product will be sold as a complete unit (control panel and robot) but I did hear that Butterfly would upgrade current owners with the new control panel at a price, although I don't know how much this will cost. With regards to purchasing one, I've found that only official Butterfly supplies will stock them, so you'll need to find your national supplier and speak with them. Average life span? I've no idea but I do know you can buy replacement parts for them and they come with a 24 month warranty from new. They'll certainly last longer than a couple of years! The new Amicus robot will be on the market probably from early September. We will send full information to our representatives as soon as these are completed which will be around mid August. They should then introduce this machine on their website right away. Therefore please keep a bit further patience and check out with your Butterfly dealer in about a month. It looks like Butterfly have released three versions of the new robot!